Joel Beckman is the leader in the dog training industry due in part to his experience training marine mammals and other exotics. He has hired and personally trained a staff that also has this unique experience and perspective. No other dog training team in the county has the experience of the Beckman’s Dog Training team. Guaranteed! Check out our trainer profiles below and see who is in your area–we offer private in-home sessions across San Diego county. Once you schedule or request an appointment with a trainer they will reach out to you to confirm the details of your appointment and training needs. In-home privates must be scheduled 48 hours in advance. Joel specializes in working with reactive & aggressive dogs, but can help with any form of training. Joel does In-Home Sessions, Online Consults & Sessions, Private Sessions at the Ramona Facility, and Group Classes at the Ramona Facility. While receiving an exotic animal education and training degree from Moorpark College, Joel Beckman devoted several years to training, caring for and performing with big cats, monkeys, camels, birds and many other exotics. At this one of a kind animal program Joel learned about conservation, educating the public, veterinary practices, proper cleaning procedures, animal ethics, entertainment and of course animal training. This experience led to Joel’s next position as a Killer Whale trainer at a world famous theme park in San Diego, California. This job not only allowed Joel to train and perform with Killer Whales, but it’s also where Joel met the love of his life. Joel uses positive reinforcement training. This is the preferred method for most marine mammal trainers, big cat trainers, therapy dog trainers, agility trainers, search and rescue trainers and many other animal training professionals. 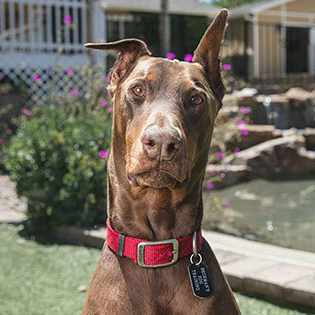 Joel Beckman has developed a one of a kind unique dog training program that’s derived from his diverse education, training and employment. With a deep profound love for dogs, and more than five years of Killer Whale training experience, Joel decided to bring his knowledge and expertise to training dogs. 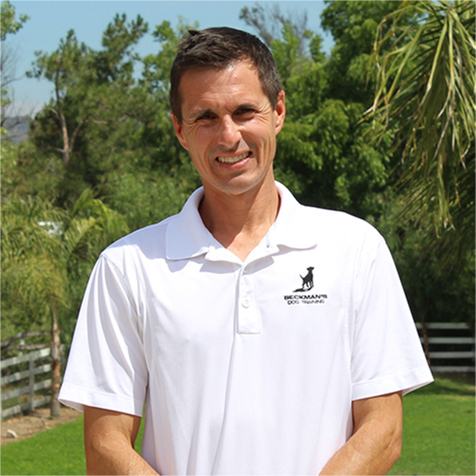 Joel is the most knowledgeable and skilled animal training professional in the San Diego area. He is an expert on animal aggression and has a deep passion for animal training. Growing up on a farm in Pennsylvania, Liz Beckman began a love for animals that has guided her life and grown into her passion of training dogs to reach their true potential. Liz feels truly blessed to have realized one of her lifetime dreams when she had the honor of training and performing with killer whales, dolphins and pilot whales for 10 years. 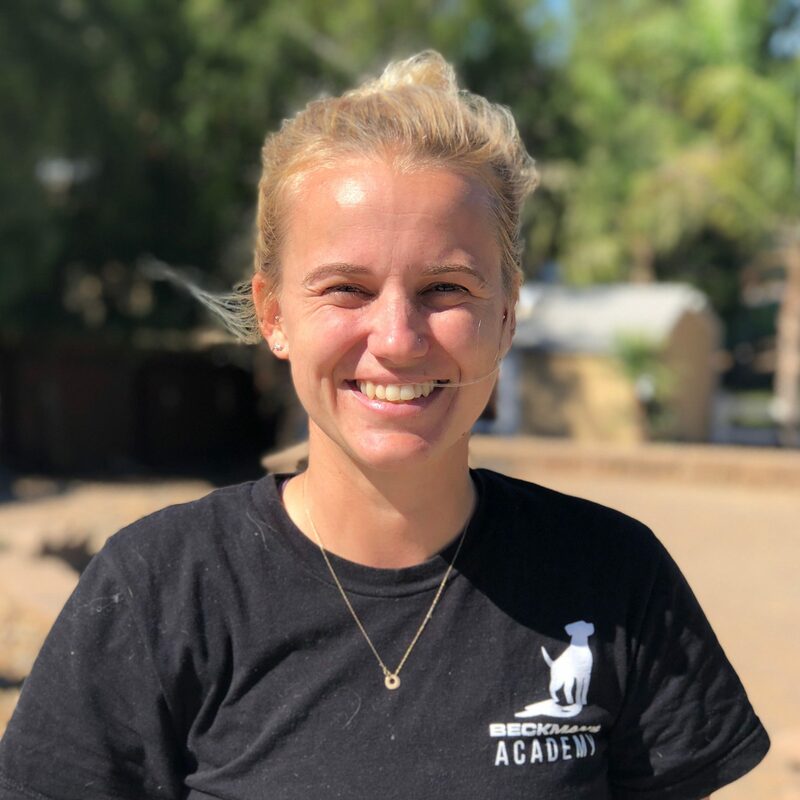 Liz feels so fortunate that she and her husband Joel shared such a rare opportunity training killer whales and she enjoys that they continue to work side by side along with their talented team of dog trainers. Liz would share with you that, “We consider it a privilege to care for such special members of your family and we really value the close relationship we’ve developed with many of our clients since bringing our skills to the dog training community in 2007. Krystin lives in the Ramona area where she does Private Sessions, Walk & Trains, and Group Classes (at the Ramona Training Facility). Krystin was born and raised in southern California but loves to travel and experience other cultures, traditions, and foods! Krystin was in the United States Navy for four years, is finishing up her MBA, and is excited to focus on her life-long passion: dog training! Her knowledge and love for dogs stems from raising and training Siberian Huskies. She has studied and been around many breeds and loves to bring out the best in each one. Krystin has been certified as a professional dog trainer through Beckman’s Academy for Dog Trainers. Whitney lives in Ramona and works predominately at the Ramona Training Facility. As well, Whitney performs Private Sessions, Walk & Trains, and Group Classes in the Ramona area. 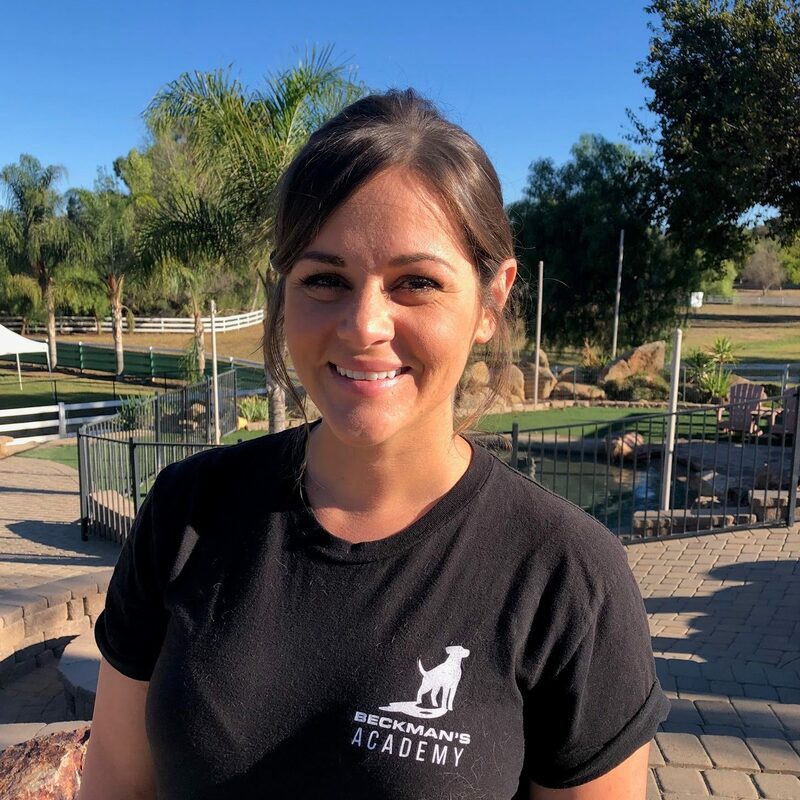 Whitney joined our team in 2018 after completing Beckman’s Academy for Dog Trainers. 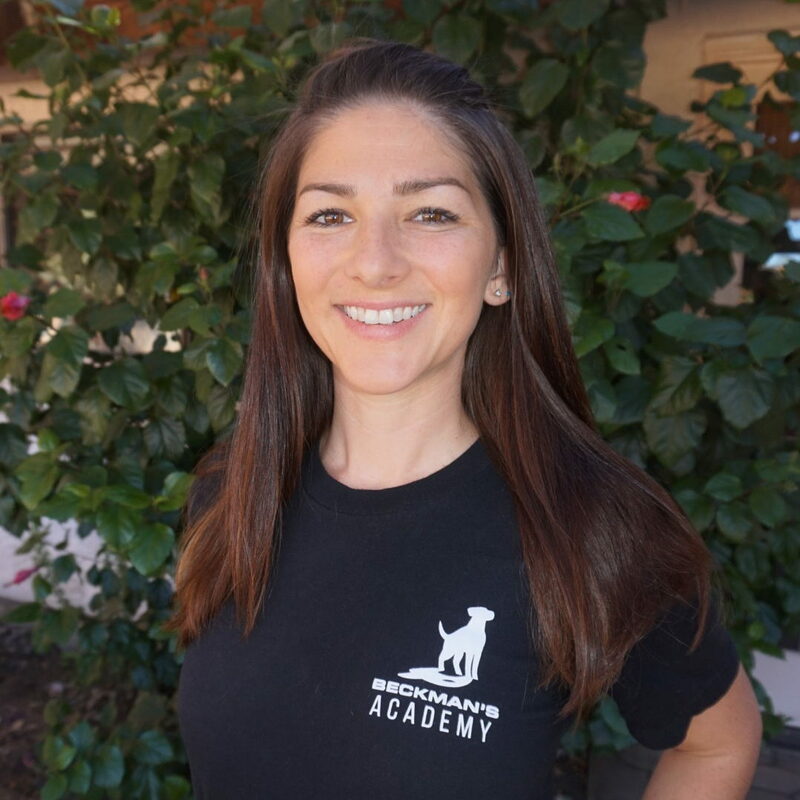 A life-long Ramona resident and graduate of Cal State San Marcos, Whitney joins us with a depth of customer service experience and a passion for dog training. In her free time you’ll find her hanging out with her husband and pug-sharpei mix, Hazel. They enjoy traveling, exploring the mountains, or heading out to the desert. Kelsey lives in Ramona and works predominately at the Ramona Training Facility. As well Kelsey performs Private Sessions, Walk & Trains, and Group Classes in the Ramona area. Kelsey joined our team in 2018 with a diverse background in the exotic animal industry. 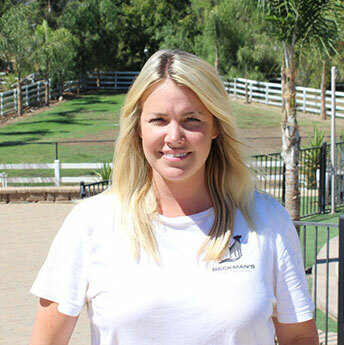 Born in the United States, but having lived around the world in places such as the Caribbean, Singapore, and Australia Kelsey has now moved back to San Diego where she works part-time with our team and part-time at the Safari Park with their Behavioral department. Some of her favorite exotics she’s worked with have been dolphins, sea lions. Tasmanian devils, and crocodiles. Kelsey is passionate about animal training and behavior and is excited to help dogs become better citizens in the world. 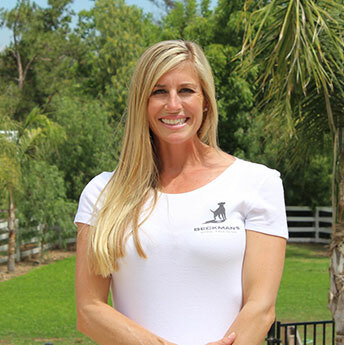 Andrea lives in the Alpine area and does Private sessions, Walk & Trains, Group Classes in Kearny Mesa & Point Loma, and Good Canine Certifications. Andrea Stewart joined the team in 2016 with 5+ years of animal training, specializing in dogs. Andrea truly enjoys training dogs of all ages and breeds. She is a certified Canine Good Citizen Evaluator for the American Kennel Club and enjoys preparing dogs for a life of therapy work. 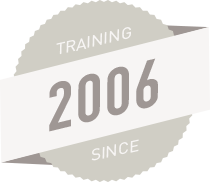 Over the years, Andrea has trained thousands of dogs in large groups and private settings. Andrea enjoys finding ways to highlight specific and special individual talents of the dogs she trains, as they vary so much with each dog. Andrea spends some of her free time volunteering at a variety of rescue and adoption events and organizations. Though he passed away in the Fall of 2018, Bosco will forever be a part of our team. Bosco helped build Beckman’s Dog Training to be what it is and was one of our most valuable trainers. He enjoyed playing with and training all of the other dogs. His main job was to help Joel and the staff with fearful and reactive dogs. He took his job seriously and loved it. He went everywhere with Joel when weather permits. Bosco worked with thousands of dogs and knows how to make even the most fearful dog feel at home. Beckman’s Dog Training wouldn’t be the same company without him. We were very blessed to have him as a part of our team. These individuals have completed the one-week intensive course at the Beckman’s facility–gaining the skills & knowledge to be called Beckman’s Certified Dog Trainers. © 2019 Beckman’s Dog Training. Site by BLVR.